1. In large bowl whisk together oil, mint leaves and vinegar; set aside. 2. With a sharp knife cut around edge of watermelon to within 1/2 inch of rind. Then cut a deep cross through the flesh, leaving rind intact and reserving for later use. Scoop out each quadrant of watermelon and cut flesh into 3/4-inch cubes. 3. 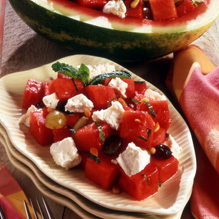 Place in bowl with vinaigrette, watermelon flesh, grapes and feta; toss gently. Use watermelon shell for serving and if necessary, slice off a sliver of its bottom so it sits level. Spoon watermelon mixture into shell and sprinkle with nuts. Garnish with mint sprig. Serve immediately.